Free Printable Bridal Shower Games. Get all the Free Printable Bridal Shower Games to help bring more fun and entertainment to your bridal shower. 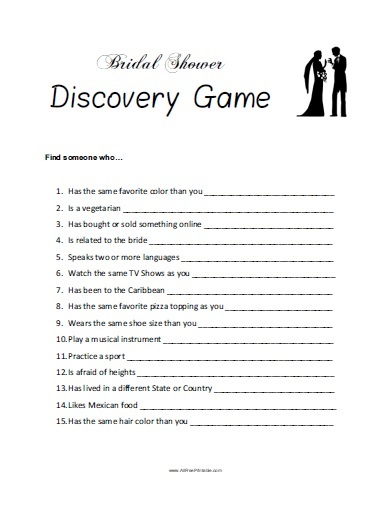 Print the Bridal Shower Games free to share with guests, family and friends at the bridal shower celebration. Print it free using your laser or inkjet printer and have fun with the bridal shower games. Get to know more about the guests with the Bridal Shower Discovery Game, unscramble the words in the Bridal Shower Word Scramble and find wedding related words in the Bridal Shower Word Search. And don’t forget a gift for the winner. Click the link below to download or print the Bridal Shower Games now in PDF format.